by Andy Higgs in Europe, Features, Home, Places, Spain. The Balearic isle of Ibiza is famous for its clubs and lounges – and rightly so. But there’s way more to this pearl of the Mediterranean that nightlife. Ibiza also has beautiful nature and superb beaches. Visitors can also discover small villages almost untouched by modern life – all in all, Ibiza has something for everyone. There are a wealth of accommodation options on the island but if you are going to visit, go in style. May we suggest the 5 star Aguas de Ibiza Hotel in Santa Eulalia? Not only is the property beautiful and extremely comfortable, it also boasts the “Vi Cool by Sergi Arola” restaurant run by one of the best chefs in Spain. The hotel is closed during the winter but then why would you visit Ibiza in the winter? Ibiza has always been desirable – indeed the island has been invaded by the Carthaginians, Phoenicians and Romans over the years and there are lots of ancient ruins from the Visigoths and the Byzantine Empire. 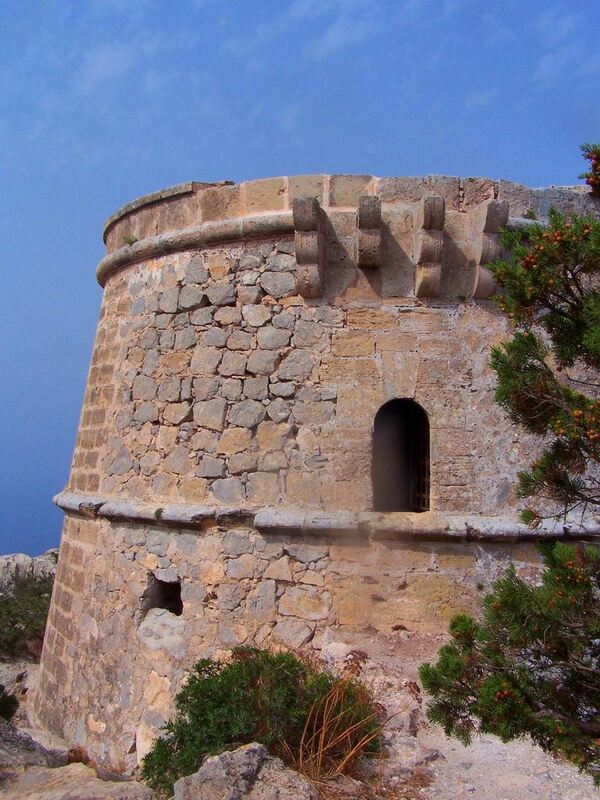 The Phoenician remains of Sa Caleta are found on the south of the island and don’t miss the fortified ancient city of D’Alt Vila located in the capital city, Ibiza Town. Another archaeological site worthy of your time is the necropolis of Puig des Molins – join a guided tour to get the most out of your time here. The island’s largest cities are Ibiza Town, where many of the clubs are located, Sant Antoni de Portmany, known for its palm tree lined beaches, and Santa Eulària des Riu, where Cala Llenya, a secluded cove, is located. Near the coast visitors will find Benirras Bay, a small beach where ships accompanied by drummers tend to congregate, beating away on their drums during the sunset. As mentioned earlier, Ibiza Town is the capital of this island and is itself an ancient fortress city with a grand Cathedral and squares. In Ibiza’s harbour visitors will be able to see the only existing statue dedicated to the corsairs, the Corsair Obelisk. There are many ancient lighthouses and windmills dotted around the island. Some windmills are in ruins, while others, including the Molí d’en Toni Joan, have been restored. The town is deservedly popular, featuring as it does a range of trendy bars, clubs with sessions hosted by famed DJ’s and wild beach parties. Many of the island’s most visited clubs are located here. Amnesia, Pacha, Privelege and Space are but a few of the many clubs located on this island. For those who do not enjoy wild beach parties and still want to enjoy the island’s party vibe, The Hippodrome is the place to be. This horse track, located in San Rafael, holds races that start around midnight and finish late at night. Take your pick but make sure you pick one according to your tastes. Platja d’en Bossa is one of the island’s best known party beaches with the Space club basically next door. There are many other bars and clubs here too and the whole area is one giant party lasting from sunrise until the next sunrise. Ses Salines is best known for its chic crowd and D’es Cavallet beach is popular with the LGBT crowd. The latter is famous for its many bars and nudist beaches. Make the effort to travel a little further out from Ibiza Town and you will be rewarded with many less crowded beaches and secluded coves. 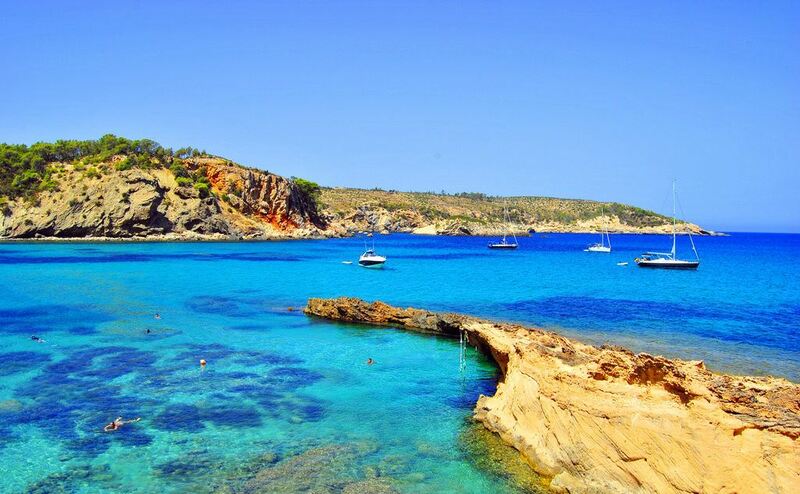 Cala Mastella, located near Santa Eulària, is perfect for snorkelling. A little further away is one of the island’s most untouched beaches, Cala Pada. The waters are clear and the sand is fine. Talamanca is an ideal beach for the entire family. Sant Joan de Labritja is a scenic region known for its pine forests and mountains. This is where you will find the C’an Marça Cave, near Portinatx, a northern town near the Puerto de San Miguel. There are actually several connecting caves which were used by smugglers. Take a guided tour complete with a light show for the best experience – you will love the underground waterfall. Cova d’es Culleram is another recently discovered cave located nearby. The Isla Es Vedra is a small rock island located in the sea, close to the coast. Boat trips can be arranged to visit the rock. Ses Salines are the island’s salt flats which are now a natural reserve used as an avian sanctuary. Its ecosystem makes it an excellent choice for scuba divers, and many flamingos can be seen in the natural reserve. There are many traditional towns in the interior of the island, including San Carlos, Santa Gertrudis and San Jose, which are still built in the typical ibicenco style. These villages feature narrow cobbled streets and houses painted white. Such houses gave Ibiza its nickname of the White Island. It may seem odd now but several decades ago the island was known for its hippie culture. Traces do still remain, and you can buy colourful crafts and handmade artwork in the many markets. The most popular mercadillo is the one held at Playa das Canar in Santa Eulària.